JOHOR BARU: An Asean solution through the network of its member countries must be taken to deal with the Rohingya refugees issue before it becomes a deadlier humanitarian catastrophe, said Datuk Seri Najib Tun Razak (pic). The prime minister in stating Malaysia's stand as Asean chairman, said it was not only the concern of Asean leaders but was also voiced out by regional and international leaders, including United Nations (UN) Secretary-General Ban Ki Moon and Australian Prime Minister Tony Abbott. "We respect the Asean principles whereby we do not interfere with the internal affairs of other Asean countries. "However when a certain problem has spread and affects the leadership of other Asean nations and possibly outside Asean, then we need to find solutions through an Asean forum and cooperate with other parties," he told reporters after officially handing over the Melana Indah Fasa 1 People's Housing Project (PPR) on Saturday. Najib said the UN secretary-general had voiced the international body's concern on the issue via a telephone call to him Saturday morning. "I told him (Ban) it is a humanitarian catastrophe that must be taken seriously by all countries. "This is not only an Asean issue but a humanitarian issue, a global issue that must be taken seriously by all countries," said the Prime Minister. Najib said Malaysia should not be burdened by the issue of ethnic Rohingya refugees, particularly when the source of the problem does not come from within the country. "We are very sympathetic towards those who were floating in the open seas. Many were killed, including children and so forth,' he said. 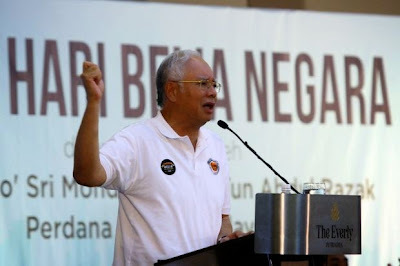 "Because of that we allow some of them to land and provide humanitarian aid to them but Malaysia must not be burdened with this problem as there are thousands more waiting to flee from their region," said Najib. Hence the prime minister has directed Foreign Minister Datuk Seri Anifah Aman to contact the Myanmar government to convey this message and hoped for a positive response from that country. "I hope they will give a positive response as the refugees were due to internal problems that we cannot interfere but we want to do something before it gets worst. "We will work through the Asean network to find an Asean solution and hope that the Myanmar government will not consider this as interfering with domestic matters but look at it as to avoid human tragedy of gargantuan proportions," he said in a firm tone. Asked if it was necessary to call for an emergecny meeting among Asean member countries, he said Malaysia was looking at several options. "Right now, we are liaising with the Myanmar government to get their response," he said. "In the next few days, we see how their (Myanmar) response is and I am in contact with other Asean colleagues," said the Prime Minister. Asked if UN would offer assistance, Najib said the international body had voiced its concern while aid could be obtained through the United Nations High Commissioner for Refugees (UNHCR). "We see what statement the UN will make," he said. On whether Malaysia would sign the UN Refugees Convention 1951 agreement, Najib said: "There are implication to that. As you know Malaysia already has 120,000 illegal people from Myanmar in the country." "To say we do not accomodate or reduce this humanitarian problem is not true. Malaysia has played a large part but we are not the source of the problem," he said. Asked if the National Service Training Programme (PLKN) was used to place Rohingya refugees, Najib said the decision was based on humanitarian ground. "We will make it based on discretion on humanitarian ground but we cannot obviously give the signal that Malaysia is open. Anyone who wants to enter, can enter," he added.